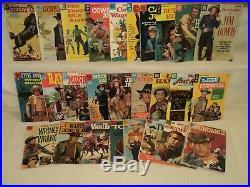 Western One-Shot LOT Jim Bowie, Jesse James 27 Dell Four Color Gold Key Comics. See More Images Below! (scroll to bottom of the description) OUR STRICT GRADES. G-; cover wrap detached from insides. Cowboy In Africa #1. FRG; new staples; stamps affixed to centerfold under staples. The High Chaparral #1. Legend of Custer #1. Legend of Jesse James #1. PR; cover split, detached from insides; small portion of story on back cover missing. FRG; small tear through spine. All our comics are complete unless otherwise stated (even Fairs and Poors)! Be sure to add “gdcomics” to your favorites. Check out my other. Is now automatically calculated based on your location. You pay what we pay! NOTE: UPS is unable to deliver to P. Our comics are the most strictly graded in the business… Stricter than Overstreet standards! All our comics (even Fairs and Poors) are complete unless otherwise stated! Our Listings are satisfaction guaranteed! Also See General Grading Refrences Below… Gary Dolgoff Comics 116 Pleasant St. Suite (#213) Easthampton, MA 01027. Our user ID = gdcomics. FN- to FVF: Beautiful tight clean and sharp copies. VG to VGF: Fairly sharp copies, clean and nice. G- to GVG: Solid, collectible copies. FR to FRG: Solid reading copies. FRPR to FR-: Complete readable copies. All comics (even Fairs and Poors) are complete unless otherwise stated! We pride ourselves on supplying you, the collector and dealer, with comics that are always better than you expect! FEEL FREE TO CONACT US WITH QUESTIONS.. The free listing tool. The item “Western One-Shot LOT Jim Bowie, Jesse James 27 Dell Four Color Gold Key (s 9167)” is in sale since Friday, August 04, 2017. This item is in the category “Collectibles\Comics\Full Runs & Sets”. The seller is “gdcomics” and is located in Easthampton, Massachusetts. This item can be shipped worldwide.